Remember that old,old post of mine: HTTP Filtered Value Set Providers and dependent enumerations ? Probably not. It goes into a little feature of Rational Team Concert that makes it easy to avoid having to duplicate data from external systems that RTC might need to integrate with. UrbanCode Deploy can do something similar for value sets for process properties. “Out with the old and in with the new” they say. So it is with the Jazz Jumpstart team. Well, kind of. Tox ‘s blog has the scoop, and I’m now part of the Rational Emerging Technologies Team. So to signal the change in a trivial sort of way I’ve changed the WordPress theme for this blog. You will notice that the incredibly valuable blogs of my ex-Jumpstart mates are still accessible from here, in addition to additional value from other members of the ULL/RETT teams, with more to come over the coming months. So my new focus area is DevOps and while this may not exactly be “new”, I think the way IBM sees it is certainly different or more holistic. 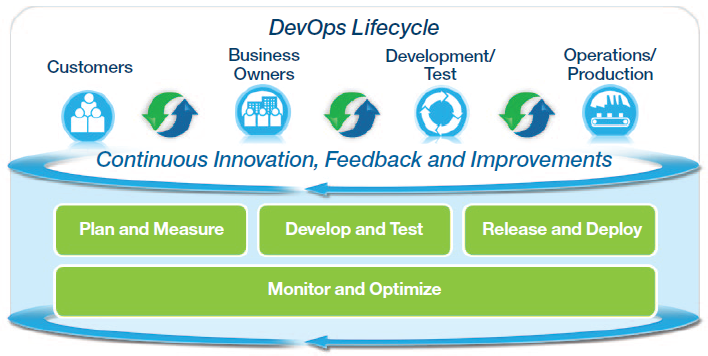 Taking a look at the DevOps entry point on IBM.com, there’s more to it than just release management and/or automation in aid of continuous delivery. Here’s a pictorial depiction of this taken from DevOps: The IBM approach a whitepaper I’d recommend reading. From a technology point of view it means I focus (initially at least) on the UrbanCode stuff and Governance of Application Development Outsourcing Solution (GADO). As an aside: there’s a little bit of a coincidence with my focus on UrbanCode. Back in July 2012, way before IBM acquired UrbanCode, in writing about Managing Android platform source with RTC I referred to an UrbanCode article “Reducing the pain of Build Failures” when talking about componentization. So I was already a little familiar with the products, but couldn’t have guessed at just how familiar I would have to become:-).